Above: Flames up to 60 feet high exploded from the Rhea Fire near Leedey, Oklahoma, on Thursday, April 12, 2018. Image credit: Courtesy Alan Broerse. Oklahoma’s third megafire in three years—the Rhea Fire, which has torched some 242,000 acres in less than a week—may grow even worse on Tuesday, as horrific fire weather conditions sweep in from New Mexico and west Texas. Relative humidity may drop as low as 3% in northwest OK, with temperatures expected to be well above 90°F and winds predicted to gust above 40 mph. The NOAA/NWS Storm Prediction Center has placed a huge swath of New Mexico, Colorado, Kansas, Texas, and Oklahoma under an “extremely critical” fire weather threat for Tuesday. It’s the most dire rating of fire threat used by SPC, and the second extremely-critical day in the past week, following Friday, April 13. “Given dry fuels and ongoing drought, the stage will be set for fast-moving fires exhibiting extreme behavior,” warned SPC in the outlook issued at 1 am CDT Tuesday. 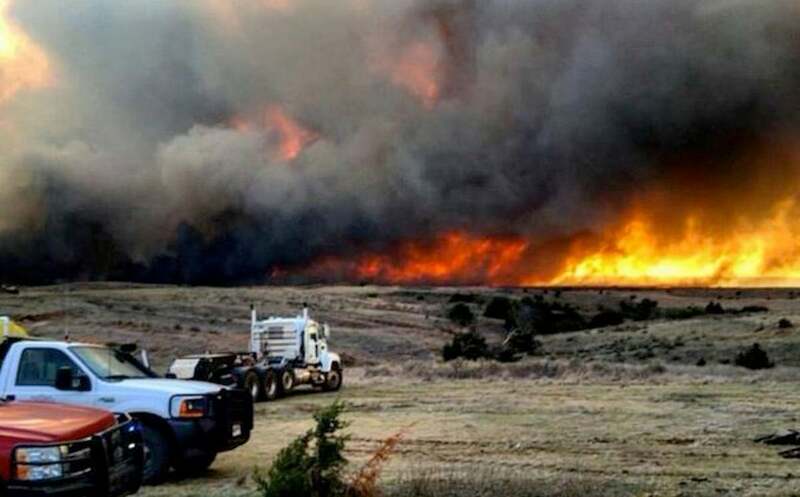 It seems that every year in Oklahoma now brings a megafire—defined by the National Interagency Fire Center as a wildfire that consumes more than 100,000 acres. March 2017 brought the even-more-massive Northwest Oklahoma fire complex, which devoured more than 830,000 acres. Figure 1. 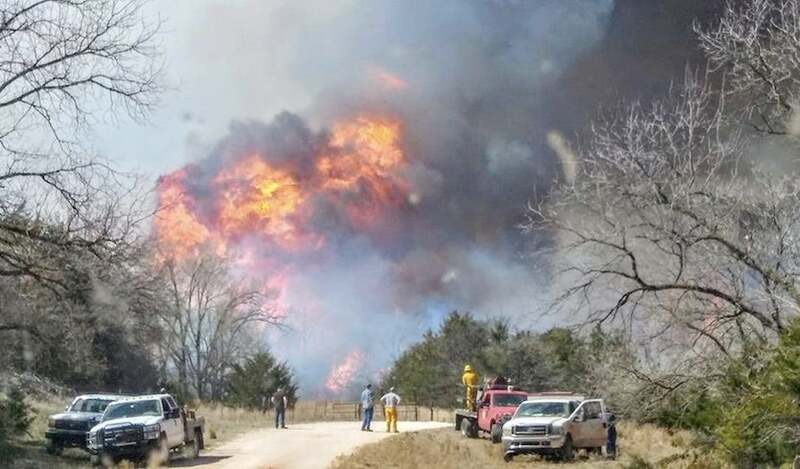 The Anderson Creek Fire raged across Woods County in far northwest Oklahoma in March 2016. 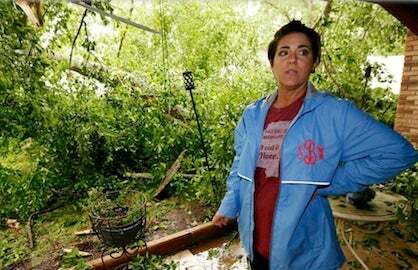 Image credit: Roy Anderson, Oklahoma Forestry Service. The sun-baked, wind-whipped Oklahoma landscape can dry out quickly in late winter or early spring. 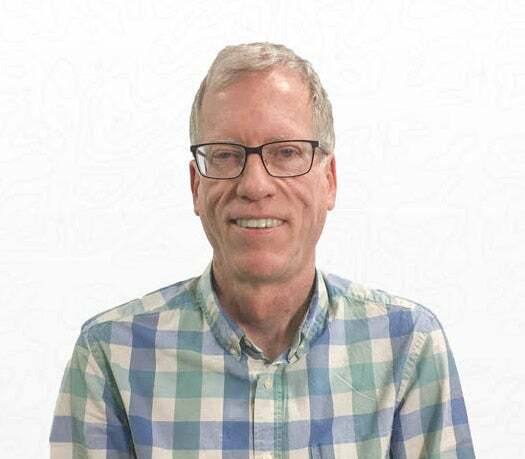 All it takes at that point is a day or two of extreme fire weather, and the main components are simple: strong winds and very low relative humidity (RH). You’ll often see very high temperatures accompanying these two, because dry air that flows downslope from the Southern Rockies, or that descends on the south side of a major spring storm system, warms up as it heads toward Oklahoma. Each of the big three fires in 2016, 2017, and 2018 has featured some variant of this hot, dry, windy pattern. Record highs have been in the mix, but it’s the very low RH (typically below 10%) and strong winds (usually gusting above 40 mph) that have the biggest impact on fire risk, just as they do in places like California. The office began using the RFTI in its fire weather graphics in 2016. Last Friday, April 13, was the first time that forecast conditions reached the “historically critical” category (essentially a subset of the “extremely critical” designation by SPC). It showed up again in the forecast for Tuesday, April 17, as shown below. Figure 2. 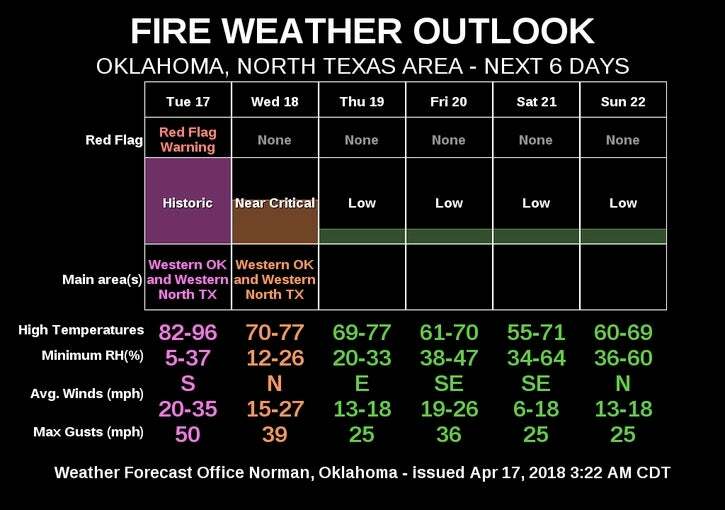 Fire weather outlook issued early Tuesday, April 17, 2018, for western Oklahoma and parts of north Texas by the National Weather Service in Norman, Oklahoma. 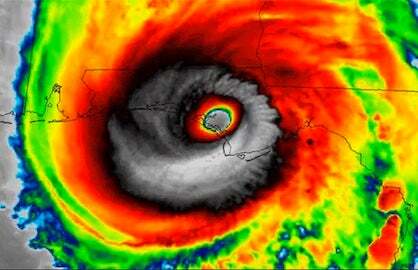 Image credit: NWS/Norman. —Alternating wet and dry periods leading to a profusion of fire-prone vegetation. Echoing a global trend that’s associated with human-produced climate change, Oklahoma has seen signs of a ramp-up in hydrologic extremes over the past few years. May 2015 was the state’s wettest single month on record, and 2015 was its wettest year. 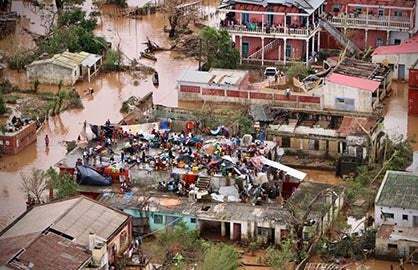 “The November-December 2015 period was the wettest on record as well, and the sixth warmest. So the growing season extended into winter to some extent that year,” said McManus. The result was an unusually lush landscape going into the first part of 2016 that dried out quickly in the weeks leading up to the Anderson Creek fire. Likewise, the summers of 2016 and 2017 were on the moist side, said McManus. “We also had a pretty severe ice storm during January 2017 that left lots of big fuels on the ground waiting for that spark,” McManus said. Later that year came the state’s second-wettest August on record. “August would normally be a time we'd get rid of some growth in our typical summer burn season,” said McManus. The landscape of the Southern High Plains has been extraordinarily dry over the last six months. 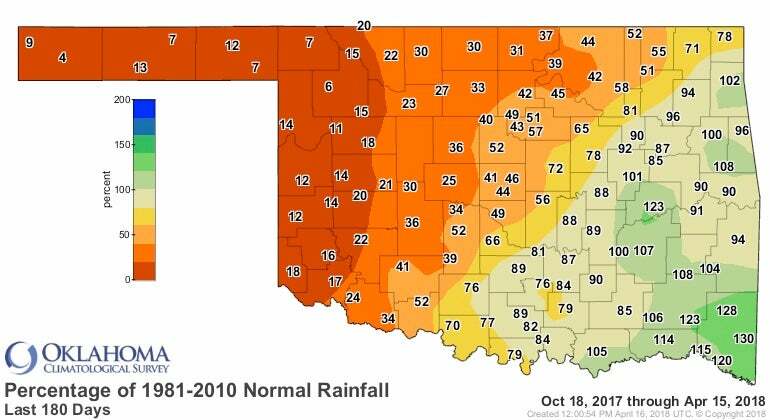 The western third of Oklahoma has seen little more than 2” since October—only about 20% of average—and most of the Texas and Oklahoma Panhandles have received much less than 1”, making it the driest six months on record in some locations. Any moistening of the landscape has been all too brief, which has left the landscape highly vulnerable to a spell of fire-friendly weather. Figure 3. 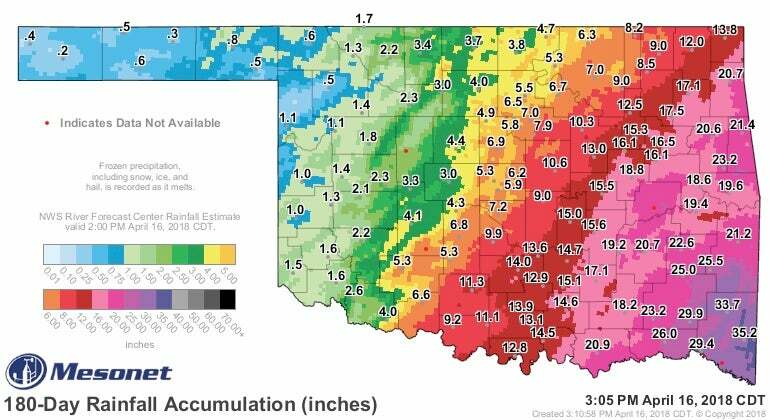 Rainfall for the six months ending April 15, 2018, has been skewed even more than usual across Oklahoma, with eastern sections far wetter than the parched west. Image credit: Oklahoma Climatological Survey. Figure 4. Percentage of average rainfall (based on the 1981-2010 climatological period) for the six months ending April 15, 2018. Image credit: Oklahoma Climatological Survey. Californians may hear some familiar notes in the refrain above. That state’s catastrophic fires of October-December 2017 followed one of the wettest winters on record (2016-17) and one of the hottest summers (2017). The moisture helped cover the landscape with a blanket of fire-friendly grasses and shrubs that dried out in the typically parched California summer. The autumn rains arrived late—especially in Southern California—which made matters even worse. Figure 5. 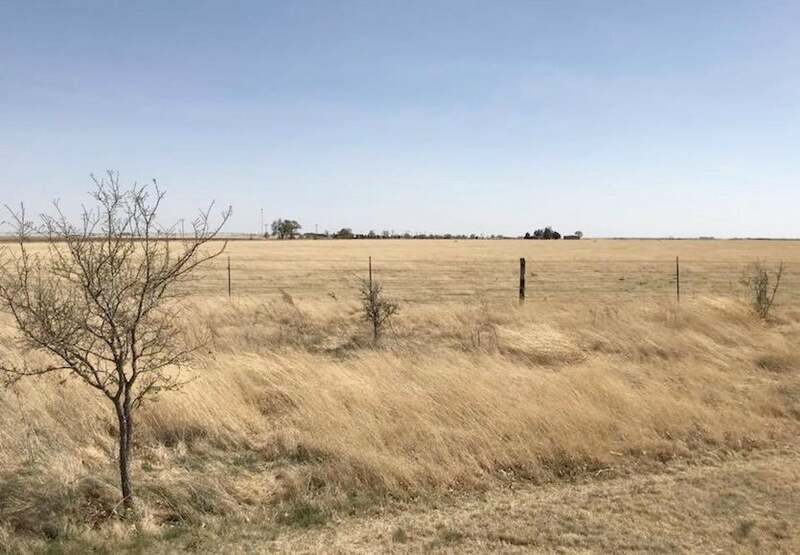 The prairie of western Oklahoma and the Texas Panhandle is packed with dried-out grasslands this spring, as captured on April 11 near Hereford, Texas. Image credit: Courtesy Rocky Rascovich. Figure 6. Oklahoma landowners can register their property with the Oklahoma Forestry Service if they have unwanted stands of eastern redcedar, which has been proliferating across the state in recent decades. Image credit: OFS. —And then there’s the redcedar. A growing complication for fire risk across the Southern Plains is the expansion of eastern redcedar. These small, tough evergreen trees, native to nearly all of Oklahoma, are the nation’s most widespread tree-sized juniper. Prior to European settlement, fires set by lightning or by Native Americans kept eastern cedar limited to small canyons or outcrops where the fires burned less intensely. According to the Nature Conservancy, “Perhaps the greatest threat to the productivity of Oklahoma's native landscapes and wildlife is the spread of eastern redcedar." Similar warnings have been issued in southern Kansas. The same volatile oils that give cedar its appealing scent—think of cedar air freshener, or cedar plank salmon—can make the tree a virtual firebomb when it’s dried out. A fire that’s racing across grasslands in hot, dry, windy conditions may get a sudden boost when it hits a bank of eastern cedar. (See the photo at top.) The species’ thick branching near the ground adds to the threat. The terrain burned by the Anderson Creek Fire in 2006 had tens of thousands more cedar trees than it did during a similar fire in 1996 that burned less intensely. Figure 7. 5-day precipitation forecast for the period from 12Z Tuesday, April 17, 2018 (7 am CDT Tuesday) through 12Z Sunday, April 22. Image credit: NOAA/NWS/WPC. Finally, some moisture for the drought zone? The unforgiving fire-weather pattern of late may finally break in favor of the Southern High Plains on Friday and Saturday, thanks to a sprawling, slow-moving Pacific storm that’s predicted to move into the Southern Rockies. Ahead of this system, moisture will be funneled across the drought-stricken plains, and there should be enough lift in the atmosphere to produce the most thirst-quenching rain in at least six months. 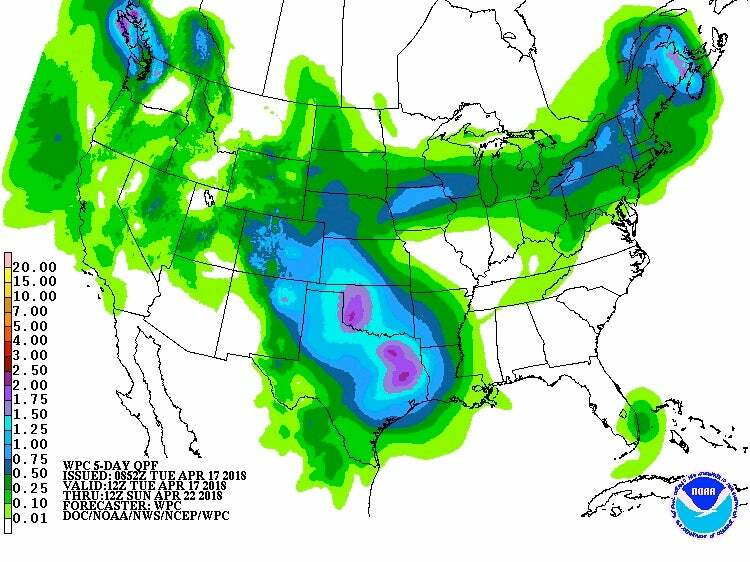 The latest 5-day outlook from the NOAA/NWS Weather Prediction Center shows a solid 1” of rain for the Southern Plains from Midland, TX, northward and eastward, including the region of exceptional High Plains drought noted in the most recent U.S. Drought Monitor (issued April 12). At least one more moist large-scale storm system may follow next week. Looking further out: the "meridian shift"
A fascinating pair of studies recently published in Earth Interactions (see Part 1 and Part II) discusses the eastward progression of the arid-to-humid boundary across the Southern Plains—historically associated with longitude 100°W, or the 100th meridian—as a result of climate change. This gradual shift may become an increasingly important factor in the fire-and-climate mix in and near Oklahoma as the century unfolds. Columbia University and weather.com have more on these studies.